We are in Transit back to Australia and our remaining stock of limited edition prints and Artist's Proofs will be unavailable until our shipping container arrives. A Rare Multiple Signature Edition of "The Shepherd". 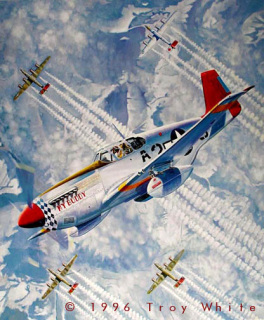 A total of only 36 prints were signed by six additional Tuskegee Airmen in 2001. These prints can only be purchased through this website. Charles Bailey was the first black aviator from Florida to become a Tuskegee Airman. He is credited with two aerial victories. He flew a total of 133 missions and received the Distinguished Flying Cross and Air Medal . George joined the 99th in April 1945. He was just 19 years of age and had arrived as a replacement pilot. He flew flew 21 combat missions in WWII. Watson participated in World War II’s first aerial combat engagement between black Americans and the Luftwaffe. After his tour he returned to the states as a flight instructor. Nappier was a bombardier - navigator flying B-25s based at Freeman Field Indiana. Nappier and 100 fellow officers were involved in the Freeman Field Mutiny and sent to a stockade in Kentucky. President Truman ordered Nappier and others released. Lem Custis, front row left, graduated in the first class of Tuskegee Airmen cadets and later served as Squadron Operations Officer. He is credited with one victory. Eddie served as a first lieutenant in the U.S. Air Force as a Bombardier Navigator, having received his training in 1945 at Tuskegee Army Air Field and Lockbourne AAF, Ohio. Wilson flew 62 missions, primarily in Italy, and is credited with one aerial victory. He was awarded the Distinguished Flying Cross, the Air Medal and the Bronze Star.